The black blade is made of 1095 high carbon steel and the red blade is made of folded steel. After sharpening, the blade is etched with an oxidation process to give the surface it's black and red color. 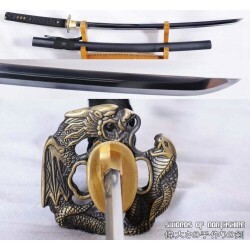 The swords come with a hardwood saya, silk sageo/ito, solid alloy fittings, and genuine rayskin. 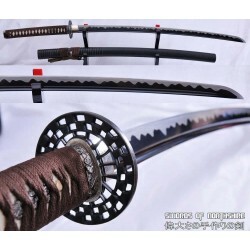 It is suitable for dojo and iaido use, gifts, cutting practice, and display. 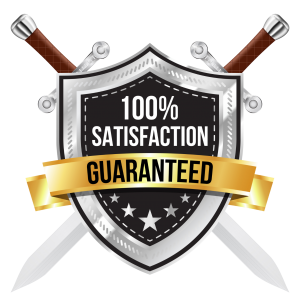 For those who want an extremely durable sword, this is a very good choice. It is strong enough for cutting tameshigiri, bamboo, bones, iron wire, and so on.